There is a lot of demand for event planners who have their certification. There are several professional organizations designated to award certifications when you can show that you have completed an event planning course, have experience, or have a degree. Receiving your certification in event planning is not mandatory for a successful career but it can help during your job search. There are professional planning associations who focus on the event planning industry in a general way and others that certify various niches within the industry (ie: meetings, catering, florists, etc). One of the most known credentials is the Certified Meeting Professional (CMP). These initials are placed after your name and are recognized by everyone in the industry as having the utmost professionalism. The Convention Industry Council is the organization that oversees CMP certification. The main CMP requirement are to have three years of experience as an event planner. You must take an exam to receive your CMP certification. The exam covers how to choose event facilities, working with service providers, and how to handle meeting programs. The International Special Events Society (ISES) is comprised of thousand of professionals in over a dozen countries representing special event producers (from festivals to trade shows), caterers, decorators, florists, destination management companies, rental companies, special effects experts, tent suppliers, audio-visual technicians, party and convention coordinators, balloon artists, educators, journalists, hotel sales managers, specialty entertainers, convention center managers, and many more. The goal of ISES is to provide education and further knowledge about the special events industry for both professionals working within the industries and for individuals and companies looking to hire a professional to manage their event. Members can receive information on the current industry trends and can participate in conferences, enabling members to increase their knowledge and be able to meet and develop relationships with other professionals within the industry. Through the International Special Events Society a member can become a Certified Special Events Professional (CSEP). This certification is recognized worldwide and is the hallmark of professional achievement in the special events industry. It is earned through education, performance, experience, and service to the industry, and reflects a commitment to professional conduct and ethics. This is a very worthwhile goal for any new event planner who wishes to enter this vast and exciting field. To learn more about the Society, their website is www.ises.com. The Professional Convention Management Association (PCMA) is a nonprofit international association of professionals in the meetings industry. PCMA provides education and resources to professionals within the convention management industry and promotes its members to the industry in general and to companies looking for reputable professionals. The Association is represented by professionals in all parts of the industry, including hoteliers, convention and visitor bureaus, audio-visual companies, and many others. The Association’s website is www.pcma.org. The National Association of Catering Executives (NACE) is the oldest and largest catering association in the world. The association addresses all aspects of the catering industry and provides both training and educational opportunities. The goal of the association is to assist caterers in achieving career success by raising the level of education and professionalism of the catering industry. NACE members can earn the designation of Certified Professional Catering Executive (CPCE). Members who achieve CPCE status are considered to represent the best in the catering profession. Further information about the National Association of Catering Executives can be found at their website at www.nace.net. As mentioned earlier there are many other event planning associations, so it is recommended that you investigate further once you have decided what area of the event industry you choose to focus on. Interested in starting my own event planning company. I’m trying to further my career in this industry and would like to get certified. 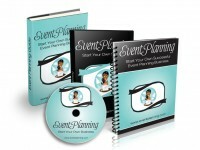 Learn how to become an event planner!